We adopted Dino, an approximately one-year-old terrier mix a year ago. 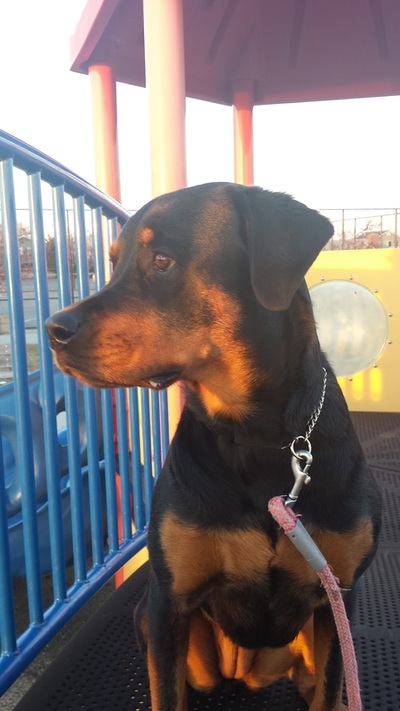 He suffered from terrible anxiety and Linda was recommended through Long Island Dog parents. She made several visits to the house over the next few months and taught us how to ease our dog!s fears and make him more comfortable in his new home. She helped us refine his leash walking skills and his house training skills, too. Linda helped us find the right harness, leash, toys, bowls, whatever we needed for Dino. She also invited us to a series of socialization classes she held which helped him get used to other dogs. Most recently, Linda has introduced us to agility training to help Dino boost his confidence and improve obedience. He's adapted to it really well and again she's proven that she has tremendous insight and sensitivity when it comes to our furry little guy. She's always accessible and reachable via email or text and is so supportive about decisions we make for Dino… She really has his best interests at heart. She has my warmest and most enthusiastic recommendation. My girlfriend and I have a Siberian Husky puppy who was suffering from anxiety when she was alone. After contacting Linda, she came to meet us in our home and observe Charlotte's behavior. Linda gave us a training regiment to help make Charlotte more comfortable at home and within a week we saw improvement. After a month she had improved so dramatically that she was able to stay crated for hours without stress when originally she would dig in her crate, drool excessively, and not even sit down for the entirety of our absence. Linda treated us very well and was easily reachable. She worked around our changing schedule and helped us a lot. My advice is that if you feel like your dog might be suffering from anxiety get it checked out as soon as possible! You have nothing to lose by asking for help, especially not from someone as knowledgeable as Linda! I Have to say Linda is amazing and my Rottweiler, Schatzi, loves her!!! I am so grateful to Linda for helping me connect in such a positive way with Schatzi. She has taught me a common sense approach to working with Schatzi, in a way that is both fun and stress-free and that has helped me shape Schatzi's responses to her environment. Linda always patiently explains and demonstrates the techniques to help me work with Schatzi and presents them in a really logical way. Robert M. and Stanley My 92 lb. labradoodle loved Linda. He would highly recommend her. Stanley , learned to be a therapy dog , thanks to Linda's patience As the owner of Stanley I would use her for any future training. Linda Keehn is absolutely amazing at training dogs and dog owners alike. She works with the dog and the owner to achieve the desired results. Working with Linda was serious work and serious fun. Linda showed great skill at reading my dog, and me. She made complicated tricks into simple tasks easily performed by my dog. It's quite apparent that she loves improving the lives of dogs and their human families through kind, positive reinforcement. Linda was patient and caring while working with my dog to train him to become a therapy dog. She was so proficient, that he passed his evaluation on his first attempt. Linda not only suggested certain approaches, she explained how and why that methodology works. I was pleased with her competency and positive energy and definitely thrilled with the results!! I highly recommend her professional and caring approach for any dog issue someone may have. Me and my Chihuahua Corocito had a wonderful experience working with Linda. She is very positive and creative when working with her students. Thanks to her, my dog aced his therapy dog test. Corocito absolutely loves Linda and we can't wait for his sister to start training with her, too. She truly cares for her students and is a kind and upbeat trainer. Linda has a great approach to training dogs! Bella and I learned so much. I would highly recommend her for training any breed. Taking Puppy Class was so much fun. Harry and all of us learned so much. We're not sure if Harry learned more or we did. Harry no longer jumps on the kids and is completely house trained. The schedule and plan you gave us really got him on track. We hope to continue in the advanced class. Buddy is so much calmer since we started training with Linda. She showed us how to exercise his brain in addition to his body and what a difference it has made. Before we started training, Buddy pulled terribly on leash. It was difficult to walk him as he is a 70 lb Labrador Retriever. After changing the collar we were using to a no-pull harness and working with Linda to teach him leash manners he is so much better. We enjoy our walks together and he is getting out so much more as a result. Simba, my male Cockapoo, and I would like thank you for training us to successfully pass the rigorous TDI examination. From the moment you entered our home we both felt very comfortable with your professionalism and passion for your work. Simba took to you immediately and he is an excellent judge of character! Your instructions and guidance enabled me to feel confident that Simba and I were in excellent hands.